DETROIT — His arms wrapped around his wife and two teenage children, Jorge Garcia’s eyes welled up Monday as he looked into their eyes one last timenear the entrance to the airport security gate. His wife, Cindy Garcia, cried out while his daughter, Soleil, 15, sobbed into Garcia’s shoulder as they hugged, with two U.S. Immigration and Customs Enforcement agents keeping a close eye on them. An undocumented family member brought Jorge Garcia to the U.S. when he was 10 years old. Today he has a wife and two children, all of whom are U.S. citizens. Jorge Garcia had been facing an order of removal from immigration courts since 2009, but under the previous administration, he had been given stays of removal. Because of the Trump administration’s crackdown on immigration, in November Jorge Garcia was ordered to return to Mexico. His supporters say he has no criminal record — not even a traffic ticket — and pays taxes every year. Jorge Garcia is too old to qualify for the federal Deferred Action for Childhood Arrivals program, which allows children of undocumented immigrants who came to the United States before age 16 and were born after June 15, 1981, to legally work and study here. Jorge Garcia said he had asked ICE officials if they could wait until new DACA legislation is passed, which might expand the age range for immigrants to qualify. But they refused and said he had to leave by Jan. 15. Shelley said he’s concerned that minority immigrants increasingly are being targeted, citing remarks Trump has made about African and Hispanic immigrants. Other immigrant advocates and an official with the United Auto Workers joined him at the airport. ► Jan. 12: Nearly 200,000 Salvadorans may be forced to leave U.S.
An ICE spokesman told the Free Press on Monday that he could not immediately comment because it was a federal holiday and ICE offices were closed. Especially painful will be the separation from his children, Soleil and Jorge Garcia Jr., 12. The Garcias said their 12-year-old son has been taking the news hard, not expressing himself, which is concerning his parents. Jorge Garcia may be barred from entering the U.S. for at least 10 years, Cindy Garcia said. Diego Bonesatti, legal services director for Michigan United, and others have been fighting for Jorge Garcia for years and now will try to get him back. Jorge Garcia’s wife is a U.S. citizen, but being married to a U.S. citizen does not automatically qualify immigrants for legal residency. Immigrant advocates say deporting people like Jorge Garcia is ripping up families and communities that have been losing population. Immigrants such as Jorge Garcia are an asset that stabilize and grow metro Detroit, they said. “It’s heartbreaking,” Bonesatti said. “If you’re going to pick someone who’s ideal,” he would be it. Moreover, Mexico is a foreign place for him, and he’s worried about finding work and creating a new life. 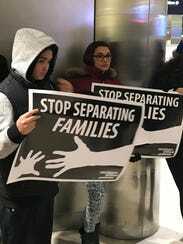 The administration wouldn’t even stop the deportations on a national holiday, said Adonis Flores, an immigrant rights leader at Michigan United, calling it shameful. Cindy Garcia, a retired Dearborn, Mich., truck plant worker, worries about supporting her family.